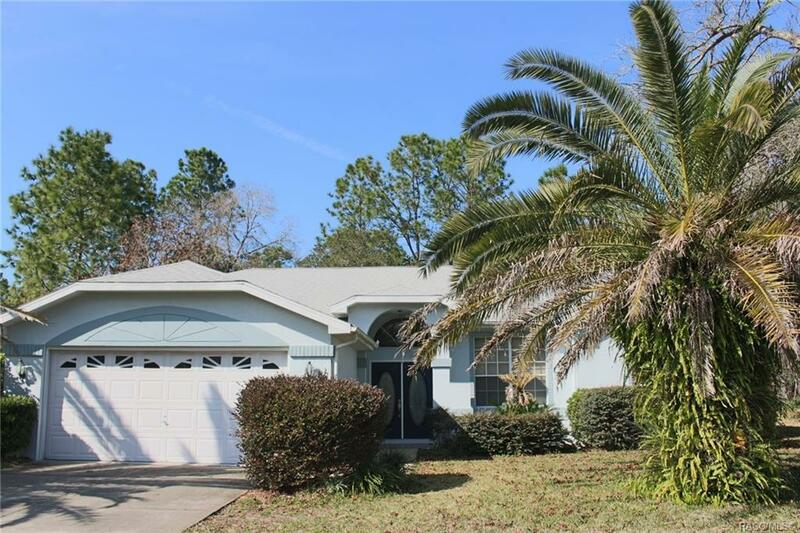 Super location for this 3 bedroom 2 bath 14x30 ft. pool home on a quiet street with underground utilities. Great room floor plan features 10' ceilings throughout. Formal dining room plus an eat-in kitchen. Roof replaced 2006; HVAC system new 2016; well for irrigation. Master features tray ceiling and walk-in closet. Master bath has access to pool/lanai. Also guest bath has hall door convenient to pool. Pocket door to guest rooms for extra privacy. New carpet in Great room & dining room. Living area laundry room has sink, cabinets and fan. Salt system pool and outdoor shower on lanai. Newer dishwasher, pool, pump and water heater. Great privacy in back yard. Don't pass up this home! Home warranty for buyers! Directions: Highway 19 South, Enter Sugarmill Woods, First Left Onto Douglas Street, Left On Linder Drive, Left On Linder Circle Home On Left.